Arts Centre to showcase international and independent cinema in Mississauga. Download your film series guide here. 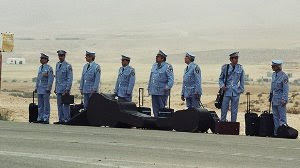 The Alexandria Ceremonial Police Orchestra, consisting of eight men, arrive in Israel from Egypt. They have been booked by an Arab cultural center in Petah Tiqva, but through a miscommunication, the band takes a bus to Bet Hatikva, a fictional town in the middle of the Negev Desert. There is no transportation out of the city that day, and there are no hotels for them to spend the night in. The band members dine at a small restaurant where the owner, Dina (Ronit Elkabetz) invites them to stay the night at her apartment, at her friends' apartment, and in the restaurant. That night challenges all of the characters.